Kitty Tylney had always shared Catherine (Cat) Howard's dream of living at court and when Cat manages to ensnare King Henry VIII's heart, she makes good on her promise to bring Kitty to court. It's there, amid the glamor of court, that Kitty discovers just how important secrets are and just how deadly some can be. Kitty is loyal to the bone, that much is definitely true; however, she does come off as a rather weak character for most of the book because of it. You see, she lets Cat walk all over her--although, to be fair, Cat is definitely in a position of power and not being on Cat's good side could ruin everything for Kitty. In that sense, Kitty's loyalty is both asset and flaw and well, don't worry, she definitely gains a backbone towards the end of Gilt. Then there are the boys: Edmund (a yeoman for the King) and William (who is in the employ of the Duke of Norfolk); both of them are definitely interested in Kitty and she seems more interested in one than the other--truth be told, I can definitely see why he's the better choice (despite one being more handsome than the other). I really can't get into why I liked or disliked one more than the other as that would definitely fall into the realm of spoilers, but I think you'll catch on (to who is better for Kitty) pretty quickly. 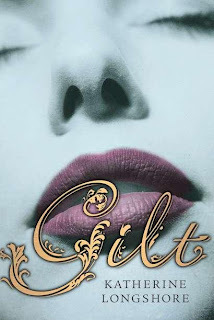 Yes, there is romance in Gilt; however, it's really not the focus of Gilt--in my opinion--nor does it really get resolved (which would be why I'm glad that there will be another book). Also, I should probably inform you that this book may be better suited to older teens given the time period and the things that went on quite commonly at court at that time--if you know what I mean. There's nothing graphic though, if you'd happen to be concerned by the possibility of that; and as for Katherine Longshore's writing style, well, it sucked me in. I loved the descriptions of the gowns, the jewels, and the occasional tapestry; they're not long winded, but they definitely paint a lovely picture. The order of events is definitely correct and in the author's note, Katherine does say that the only two characters who are more fiction than fact are--if I'm remembering this correctly--Edmund and William. Overall, Gilt proved to be a wonderful historical read that really captures the era quite well and I'm definitely looking forward to seeing where things go in the next book. Admittedly, I feel like this could've almost been a standalone and if that had been the case, I would've been quite happy with it; but as it's just the first book, I'm definitely looking forward to seeing what will happen next! (And if you wanted to know, it's written entirely in first person from Kitty's point of view.) If you enjoy historical fiction set in the 15th century (and taking place in Henry VIII's court) as well as a bit of court intrigue, definitely pick up a copy of Gilt! I have this ARC, so I guess I need to read it soon. It sounds so good!